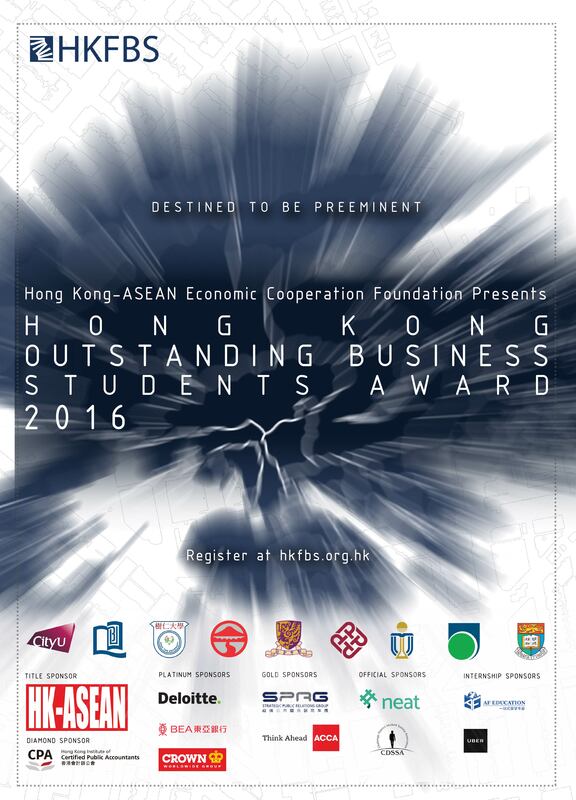 Founded in 2013, Hong Kong Outstanding Business Students Award 2016 (HKOBSA) is the first formal recognition for outstanding business undergraduates from the 9 local universities held by Hong Kong Federation of Business Students (HKFBS). HKOBSA marks a new epoch in the academic arena, inasmuch as it provides a brand new platform for promising business undergraduates to recognise their abilities and to foster the exchange of business ideas among the participants. HKOBSA 2016 consists of five assessment stages, namely First-round Interview, Second-round Interview, Promotion Challenge, Business Elite Program and the Youth Business Elites Forum. The whole assessment process will be conducted by the Evaluation Committee panels, which are elites from the Academic Field and Business Field. The most excellent candidates will be promoted to the aforementioned final stage to further compete for the overall championship, the first runner-up and the second runner-up.